Yojhan Quevedo hadn't been much of a power and run-producing threat in his first seven seasons, but Class A Clinton hitting coach David Flores felt he would eventually break out. On Monday, the Seattle catching prospect did just that. 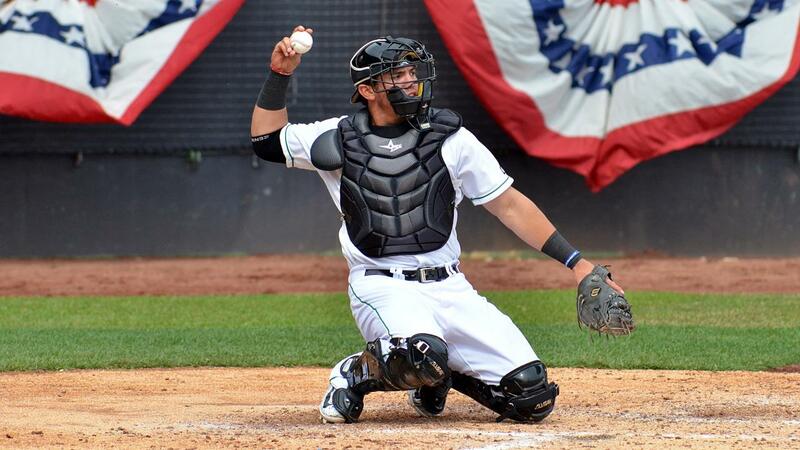 Quevedo homered and drove in a career-high five runs to lead the LumberKings to an 11-3 win over the Wisconsin Timber Rattlers at Ashford University Field. It was the second professional five-RBI perfomance for the Venezuelan native, who last completed the feat in the Rookie-level Venezuelan Summer League on May 13, 2013. "He's had several [good performances] over the last few weeks, some three-hit games," Flores said. "He's been doing the same thing with his approach and staying aggressive on pitches in the zone. He's been working in the cage on using his hands, and just once he goes out on the field, he's being aggressive. At times when the pitch is off it could hurt him, but right now, he's getting good pitches and he's really driving them." Quevedo has gone deep twice in May after hitting one home run over the previous three seasons. It's part of a month in which he's produced a .349 average and reached safely in 11 of 14 games. "He's pretty consistent with his work every day," Flores said. "He has the same routine, working with his hands on the tee, soft toss, things like that. He's been one of our most consistent hitters this season, so you always expect him to do well. ... It speaks a lot to his personality, he brings a lot of energy. He's upbeat no matter If he's 0-for-4, 4-for-4, he's always positive." With two runners on and one out in the first inning, Quevedo ripped a first-pitch single to center field off Braden Webb to plate No. 28 Mariners prospect Rayder Ascanio. An inning later with two on, the 23-year-old found his power stroke. Quevedo smacked a 2-1 heater from Webb over the left-field wall for his second dinger of the season. "We teach our guys to stay on the fastball and make sure you're locked in to hit their best fastball. He did that time," Flores said. "It was an advantage count for him and he got a fastball that was middle-in and he crushed it -- no-doubt home run. To be honest, he has really quick hands. I think he's just learning how to consistently barrel up balls." After a ground out to second base in the fourth, Quevedo came up with one one out in the sixth and lofted a fly ball to center that was deep enough to score Luis Rengifo from third. Clinton's cleanup hitter capped off his day when he beat out grounder to second base for an infield single in the eighth. Flores wasn't surprised to see the "athletic" Quevedo hustle to first for a hit. "He has decent speed for being a catcher, he can move down the line," Flores said with a laugh. "He can move a little bit." But what impressed the first-year hitting coach the most about Quevedo's day was his approach with two strikes during his last two plate appearances. Over his last 265 at-bats, he's fanned just 35 times. "He's a guy that doesn't really strike out and he takes it personally when he strikes out," Flores said "If you look at his numbers last year and this year, his strikeout rate is really low, especially for a catcher. He really likes to put the ball in play with two strikes and he likes to battle. He takes it personally when he doesn't do that." Seventh-ranked Mariners prospect Joe Rizzo collected three hits and two RBIs. No. 19 Luis Liberato smacked his fifth homer of the year and Rengifo scored three times. Brandon Miller (6-2), the Mariners' 18th-ranked prospect, struck out a career-best eight. He allowed three runs -- two earned -- on seven hits and a walk in six frames. Trever Morrison belted a two-run homer for Wisconsin.